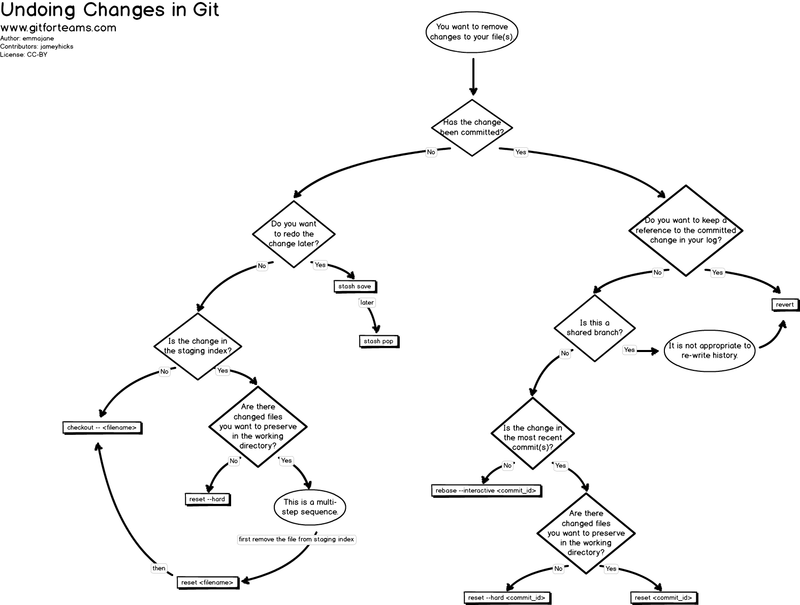 How is Git different from other VCS (Version Control Systems)? Probably the most obvious difference is that Git is distributed (unlike SVN or TFS for instance). This means, you’ll have a local repository which lives inside a special folder named .git and you’ll normally (but not necessarily) have a remote, central repository where different collaborators may contribute their code. Note that each of those contributors has an exact clone of the repository on their local workstation. Git itself can be imagined as something that sits on top of your file system and manipulates files. Even better, you can imagine Git as a tree structure where each commit creates a new node in that tree. Nearly all Git commands actually serve to navigate on this tree and to manipulate it accordingly. Before starting here, I highly recommend to first go through the initial pages of the Git Reference Manual, especially the “Getting Started - Git Basics” part. clone - copies an existing git repository, normally from some remote location to your local environment. fetch or pull - is like “update” or “get latest” in other VCS. The difference between fetch and pull is that pull combines both, fetching the latest code from a remote repo as well as performs the merging. remote - these are “remote” locations of your repository, normally on some central server. SHA - every commit or node in the Git tree is identified by a unique SHA key. You can use them in various commands in order to manipulate a specific node. head - is a reference to the node to which our working space of the repository currently points. branch - is just like in other VCS with the difference that a branch in Git is actually nothing more special than a particular label on a given node. It is not a physical copy of the files as in other popular VCS. I do not want to go into the details of setting up your workstation as there are numerous tools which partly vary on the different platforms. For this post I perform all of the operations on the command line. Even if you’re not the shell-guy you should give it a try (it never hurts ;) ). To setup command line Git access simply go to git-scm.com/downloads where you’ll find the required downloads for your OS. More detailed information can be found here as well. It is common practice to use the “presence” in commit messages. So rather than writing “added my first file” we write “add my first file”. So if we now step back for a second and take a look at the tree we would have the following. Btw, note that this time I used git add . which adds all files in the current directory (.). From the point of view of the tree we now have another node and master has moved on to that one. Branching and merging is what makes Git so powerful and for what it has been optimized, being a distributed version control system (VCS). Indeed, feature branches are quite popular to be used with Git. Feature branches are created for every new kind of functionality you’re going to add to your system and they are normally deleted afterwards once the feature is merged back into the main integration branch (normally the master branch). The advantage is that you can experiment with new functionality in a separated, isolated “playground” and quickly switch back and forth to the original “master” branch when needed. Moreover, it can be easily discarded again (in case it is not needed) by simply dropping the feature branch. There’s a nice article on understanding branches in Git which you should definitely read. Note you can directly use the command git checkout -b my-feature-branch to create and checkout a new branch in one step. What’s different to other VCS is that there is only one working directory. All of your branches live in the same one and there is not a separate folder for each branch you create. Instead, when you switch between branches, Git will replace the content of your working directory to reflect the one in the branch you’re switching to. Note, this time I used the git commit -a -m to add and commit a modification in one step. This works only on files that have already been added to the git repo before. New files won’t be added this way and need an explicit git add as seen before. So far everything seems pretty normal and we still have a straight line in the tree, but note that now master remained where it was and we moved forward with my-feature-branch. Lets switch back to master and modify the same file there as well. Note the comment git prints out. What does that mean? Detached head means “head” is no more pointing to a branch “label” but instead to a specific commit in the tree. Undoing is probably the operation besides committing that’s most useful about a version control system. You can quickly try out something, and if something breaks, simply dismiss your changes or jump back to a previous, working version. GitHub recently published an interesting article that might help as well: How to undo (almost) anything with Git. There’s more to discover on the site gitforteams.com. If you need to rollback an entire commit and (even worse) you might have synched it to a remote repository already, then using git reset --hard might not be so nice as in that way you’re somehow rewriting history which is a no-go if you synched your repo to a remote one already. Another common scenario of “undoing” stuff is to simply discard local, yet uncommitted changes. 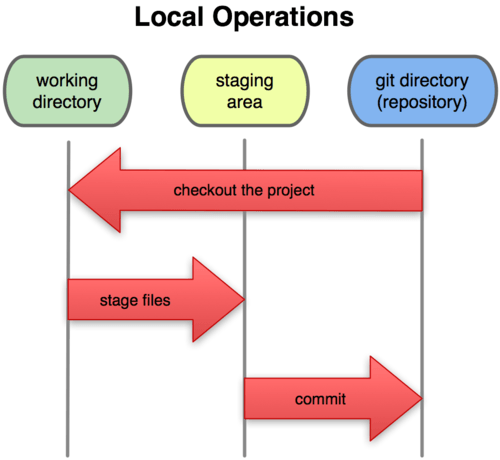 So far nothing has been added to your local Git repo, nor has it been staged (registered) for being committed. What would it mean to discard those changes?? Think about the Git tree. Simply to get (checkout) the latest version of that file, right?? The other case might be when you modified a file and already staged it for being committed through a git add commit. A git checkout wouldn’t have any effect in this case, but instead (if you read what git printed on the status output) we have to do a reset. Why? Because the git add already created a node in the Git tree (actually not 100% correct: see Git index vs. working tree for more details) which have not yet been committed yet, however. Therefore we need to “reset” our current pointer to HEAD which is the top of our current branch. command which will do an un-staging + checkout in one command. If you have to add more, just let me know in the comments!